With originals something of a rarity and Chris Evans reported to have paid £12,000,000 for one, Ferrari GTOs have become serious investment fodder. Happily, Historics at Brooklands is offering a beautifully executed recreation of a Ferrari 250 GTO for auction on Saturday 25th September, at a fraction of the cost of a genuine car. The 1965 Ferrari 250 GTO Evocazione offered for sale by Historics, is expected to fetch a more manageable hammer price in the region of £240,000. 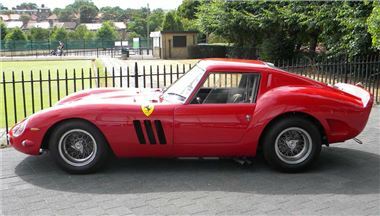 Based on an original, matching numbers, right hand drive Ferrari 330 GT, the car was purpose built to create an authentic copy of the only right hand drive 4.0 Litre five-speed 250 GTO, built by Ferrari to compete at Le Mans. Completed in 1993, the chassis was shipped to Italy where it was shortened and converted to GTO specification, before a handmade aluminium body was painstakingly sculpted, and subsequently returned to the UK for fitting by Ferrari experts. Demonstrating the quality of this painstaking project, the car features a number of correct GTO parts, as well as proving visually accurate thanks to an original 400mm GTO steering wheel, original style gauges and the correct 7” front and 8” rear Borrani wire wheels. Designed as a tribute to the Le Mans racer, this Evocazione has also seen action on the track, achieving a number of wins and podium finishes at the hands of renowned historic racers, and remains ready to race in a number of events as well as being fully road registered.